Finish Spitz are not known for being quiet and biddable. They have a mind of their own: the Finns describe them itseppäinen (that is ‘stubborn’ if you are being polite and ‘bloody-minded’ if you are not). The breed standard says that they should be ‘lively’ and they certainly are: standing still does not come naturally. They are also expected to range in the Finnish forests searching for capercaillie (very similar to the black grouse we have in Scotland) travelling many miles well away from the hunter. In fact, we were once walking with a Finnish breeder and, used to our own dogs going beyond the horizon if they were off the lead, complimented him on his youngster who was well-behaved and stayed close. He told us he was going to sell it as a pet as it was not adventurous enough: he needed a dog that would go well out of sight and bark when it found a bird. But they can be trained. In recent years, as we have understood the breed better, our own dogs have been positively civilised. They do not bark unnecessarily, they will ‘stay’ ‘come’ and we have no concerns when they are off the lead. Although, that said, some owners do not train them as well as they might. In Finland dogs are seldom shown as most owners are more interested in their hunting ability and not what they look like. But when they have earned three working trials Challenge Certificates they appear in the show ring because to become a champion they are required to have at least a ‘Good’ grading at a championship show. This does not mean that they are not beautiful examples of the breed. Last year when judging at the Jyväskylä Championship Show in Finland, Angela found just such a dog and she suggested that he would do well in the UK and perhaps he should bring him over and show him at Crufts. He did so and the dog got his first UK Challenge Certificate under breed specialist Lucy Byrne and was pulled out in the Group by one of our breed’s most respected all-round judges, Jeff Horswell. I tell this story because on the Thursday before Crufts this intelligent, working dog travelled in the hold of a Finnair jet, went through the performance of certification, injection and paperwork patiently and calmly, travelled to Birmingham, stayed in strange hotels, faced the inevitable noise and, for a dog at least, the chaos of Crufts without turning a hair. He stood for the judge to go over, moved beautifully on the green carpet both in the breed ring and a huge noisy main ring, stood calmly for both judges without a care and certainly no visible signs of stress. He is just one example of around 22,000 dogs which behaved impeccably over the four days of Crufts. They and their owners are to be congratulated on having stable, well-behaved dogs which are all that the Kennel Club Good Citizen Scheme could desire. On their benches and moving about the packed halls, they allowed any of 160,000 people, many of which were children, and their pushchairs, electric wheelchairs and tricycles to approach them, stroke them, bump into them without protest, complaint or objection. Approaching this whole subject from a different direction I would draw your attention to the editorial in Our Dogs which appeared in the week of Crufts. Our leader writer asked everyone to be ‘press aware’ and suggested that we should ‘enjoy Crufts to the full but without fuelling the hacks of Fleet Street with tales of woe, or threats or poisonings and let’s all think twice before leaping to the keyboard to have a go at this or that issue’. This polite request was directed at the few thoughtless exhibitors who cannot resist passing on the latest, usually un-attributable, gossip. In the event, I and many others were disappointed that at the top end of our sport several people who should certainly have known better, behaved in a way that provided the press with plenty of damaging ammunition without a journalist having to lift a finger. The Kennel Club and breed clubs’ work of eight years since the debacle of Pedigree Dogs Exposed (and many years’ much less publicised efforts prior to that broadcast), was damaged in a few days by a handful of experienced exhibitors and judges who undermined the extraordinary success of every other aspect of the event with their thoughtless and covetous behaviour. Were rules broken? It does not matter: common sense was rejected and disastrous decisions were taken with no thought for the consequences on what has been a gradually improving image of pedigree dogs in the UK. I will say no more about the Gordon Setter whose lap of honour in the Group would have been cheered and recognised as an example of good sportsmanship. This writer is seldom lost for words but I was close to it and almost in tears as I watched the recorded coverage of the Pekingese struggling around the ring and the German Shepherd Dog in a state of near panic. There really can be no excuse for putting any dogs through such trauma. The Pekingese is a small dog and we can have some sympathy: the world of dogs could almost have got away with that but I am afraid that the ‘explanation’ from the GSD fraternity about the crowds, the carpet, that it was ‘fine in the breed ring’ (no it was not – the evidence is freely available on You Tube), and the ridiculous suggestion that one of our gentlest and thoughtful judges handled the dog roughly, exposed a degree of desperation which was shown to be ridiculous by the exceptional behaviour of almost every other dog that appeared in the group rings: almost all of them and their handlers coped brilliantly in precisely the same conditions. Back in September 2014 the Kennel Club issued advice on the uses and abuses of social media and said: ‘Anyone judging at Kennel Club licensed events is warned that in certain circumstances the Kennel Club will refer inappropriate content to the Judges Sub-Committee for a review of status and future appointments.’ One wonders whether the decisions of the owners/handlers to bring these two dogs into the ring was itself ‘inappropriate’ perhaps even to the extent of bringing the world of dogs into disrepute. Two, perhaps three years ago the Kennel Club brought together all the Pastoral Group Judges for a meeting at the Kennel Club Building at Stoneleigh for a seminar which tried to bring some understanding and consensus about German Shepherd Dogs. Gary Gray and his team put together a number of excellent presentations and I sincerely hoped that some progress was being made to bring the extremes to at least some semblance of understanding if not actually together. It was clearly a waste of time. When the spine of any dog is not just bent but has an angle of 130° in the middle of its back (watch the slow motion coverage I am not exaggerating) and its rear pasterns are virtually flat on the floor at the extended trot, a breed must be considered a long way short of fit for purpose. I am not for a moment suggesting that we should be returning to the ultra-long level backed dogs with the extended second thighs of the 50s and 60s but there must surely be a reasonable compromise which allows this breed, which should be so greatly admired, to return to its roots. I have used this picture before but I have no hesitation in bringing it to your attention again. 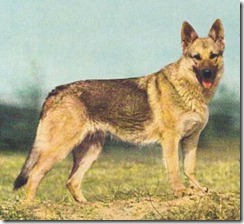 This photograph was used as a frontispiece of a book published in Germany in the mid-1950s which at that time typified the correct type for German Shepherd Dogs. The fact that it is German breeders who have distorted this lovely breed beyond recognition does not make it right or mean that we in the UK have to slavishly follow suit when what is happening is not in the best interests of the breed’s health. I rest my case.